PPA Volunteer Win Dada and PPA Board Member Kurt Hansen draw the lucky winner of the TW Steel Wrist Watch Giveaway. 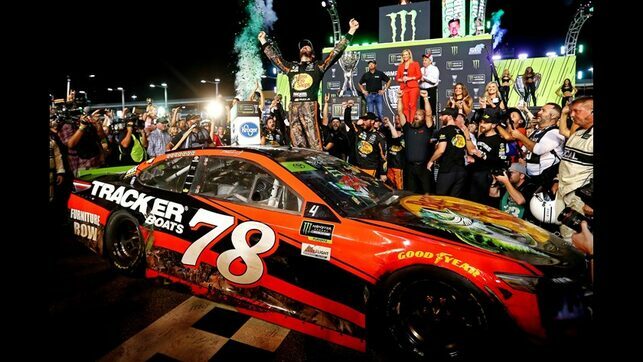 NASCAR CHAMPIONSHIP BROUGHT TO DENVER BY FURNITURE ROW!!! 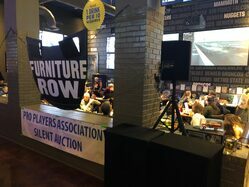 NASCAR Final Race Of The Year Party/Social and Auction was held Sunday, November 19 at Quaker Steak & Lube, 10392 Reed Street, Westminster, CO. Kurt Hansen Host of RaceCentral Radio/TV and his race friends had a great party to cheer on the Furniture Row/Truex Team. 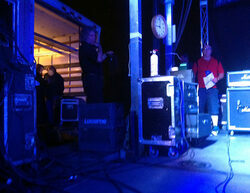 9NEWS hung out with us throughout the event and broadcast live the last laps and celebration. 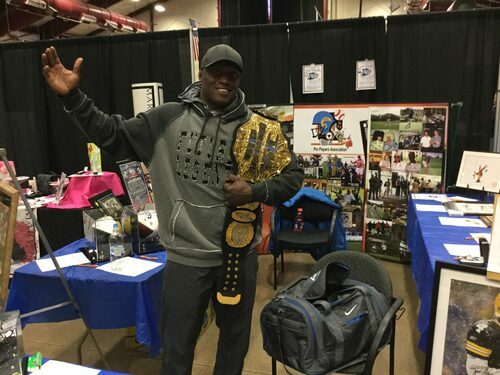 Several great items were won in the Silent Auction presented by Pro Players Association Auction Assistance Program which raised funds for cancer awareness programs. Douglas County Lifestyle Expo, Douglas County Events Center, Fairgrounds Dr., Castle Rock was held Saturday, Feb. 4, 2017. 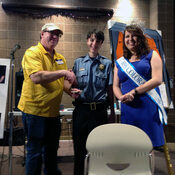 PPA held an Autograph Session and Silent Auction. "Warm Your Buns 5k" was run on a cold 24 degrees morning. 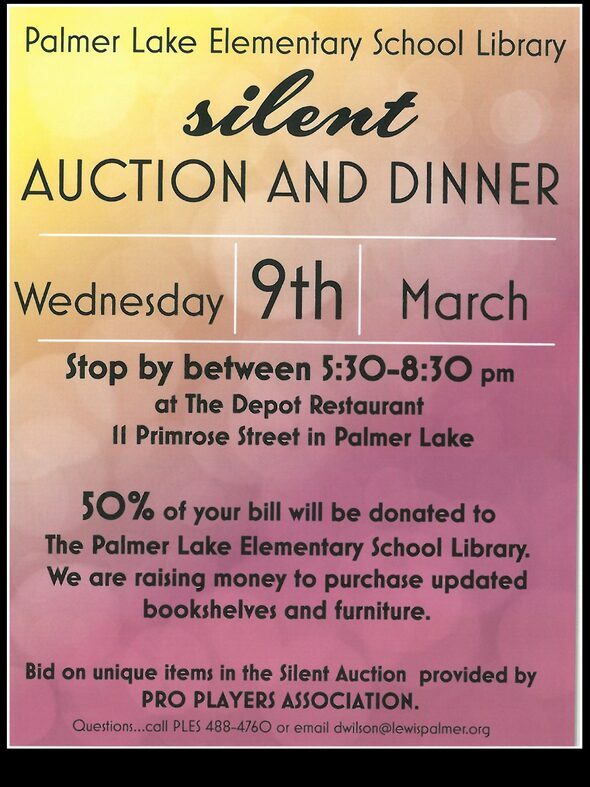 Pro Players Association presented a Silent Auction on Wednesday evening, March 9th, 2016 at The Depot Restaurant, Palmer Lake to benefit the Lewis-Palmer Elementary School Library. 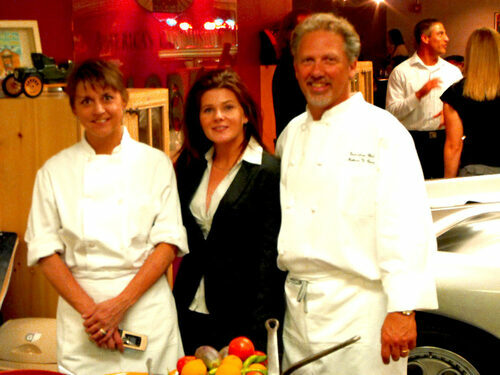 This event produced a full house and a successful evening for the charity! 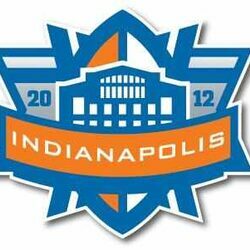 Awesome items were up for bid to benefit this great cause. 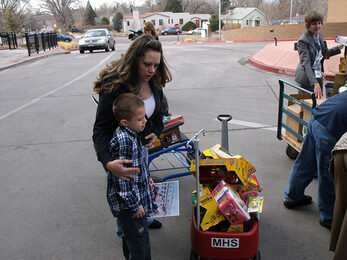 The Depot donated 50% of their profits from food and drink purchases to the School Library. Thanks to SOCO Radio; KUHS/Fred McHenry; Gil Whiteley, Chris Brewer, Mike Luper at Mile High Sports Radio for their promotional announcements of the event! 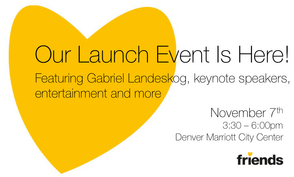 Official Launch of Friends Colorado with Gabriel Landeskog, Captain, Colorado Avalanche. Pro Players Association's CEO Gary R. Adler attended the launch of a new organization to Colorado coming to us from Sweden. 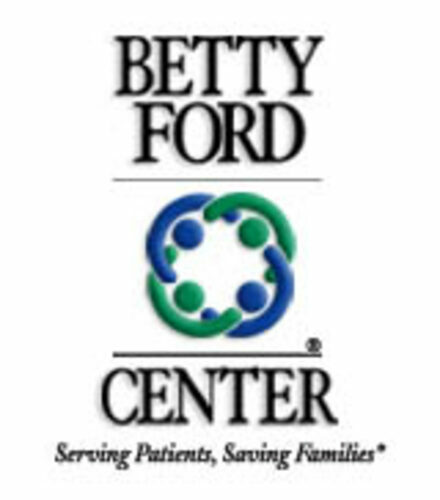 We look forward to working in association with Friends Colorado in the near future. Friends Colorado is a non-profit organization dedicated to the prevention of bullying. They educate and support schools and sports clubs throughout Colorado with the vision to see young children and adolescents grow up in a safe and secure environment. 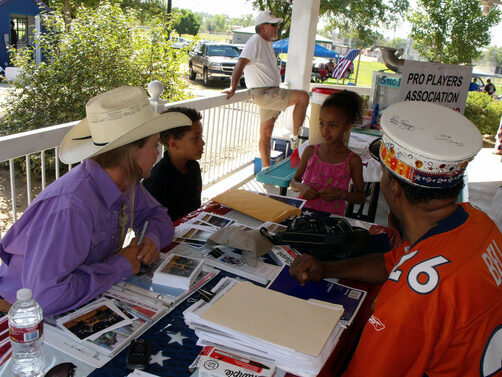 Pro Players Association worked in association with Dean Gary Events in producing the first annual Castle Rock Freedom Fest at the Douglas County Fairgrounds, 500 Fairgrounds Dr., Castle Rock, Saturday, August 22. 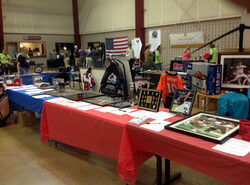 Pro Players Association presented a silent auction in the events center which went on throughout the event. 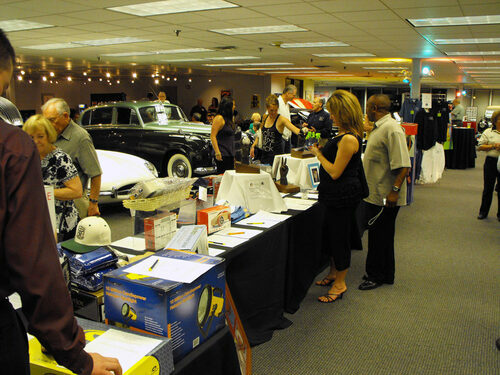 We had a huge booth for the silent auction in which we offered over 100 items! 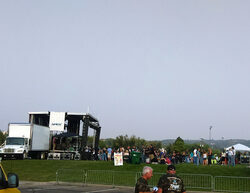 An area of the booth was set aside for an autograph session inside the Douglas County Events Center. 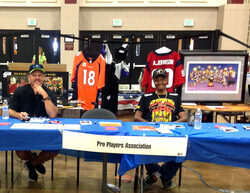 Celebrity members of the Pro Players Association including several Denver Broncos Alum signed autographs. 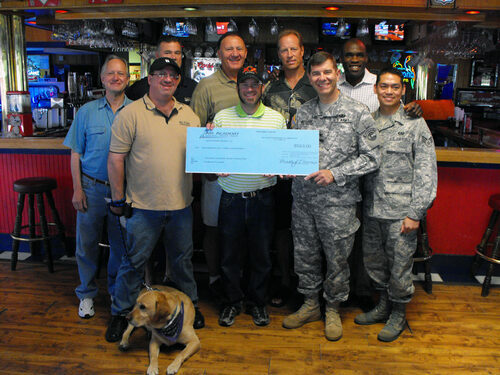 Benefited AmericanSoldierNetwork.com Honoring and Supporting the American Soldier! 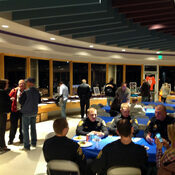 Pro Players Association proudly presented a Pasta Dinner & Silent Auction to benefit the Beverly Mooney Memorial Fund. 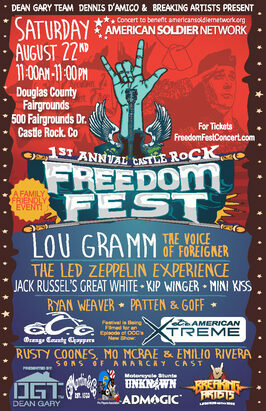 The event took place at Kirk Hall at the Douglas County Event Center and Fairgrounds in Castle Rock, CO. Saturday evening May 31st, 5:30-8:30pm. 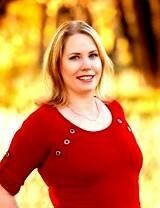 Beverly, 33 years old, passed away suddenly on Saturday, March 22, at home. She was battling Lymes disease, but her passing was unexpected. Beverly adored all children and was inspired to make a difference in the children of today. She was looking forward to becoming an educator in a local church school system. Beverly left an immediate family consisting of her husband David and two children, Ethan 6 years old and Mikayla 4 years old. David is a firefighter and veteran of the U.S. Air Force and U.S. Army. The family is now in dire need of financial assistance. 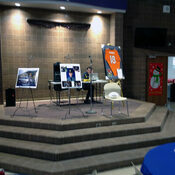 A Silent Auction was presented featuring several memorabilia, collectible and special opportunity items for bid. A 50/50 will also took place awarding the winner half of the collected funds. The winner generously donated their portion back to the charity! Thanks to the volunteers who cooked and assistied n other capacities at the event. Thanks to Safeway, Walmart, Orowheat and Carrabba's Italian Grill who dedicated sponsorship. Financial contributions can be sent directly to: Beverly Mooney Memorial Fund, 1st Bank, 4775 Front St., Castle Rock, CO 80104. Thank you to all who took part in the event! 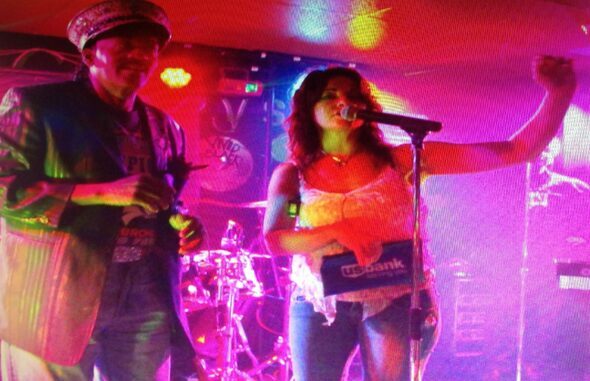 McCarthys came through once again generating $1265 in funds for Disaster Relief! The 46" HDTV was given away Saturday, July 13 to a lucky donor at the sports bar. Thanks to Mike Martinez and his staff, especially Dan, Lori and Taylour for their assistance. 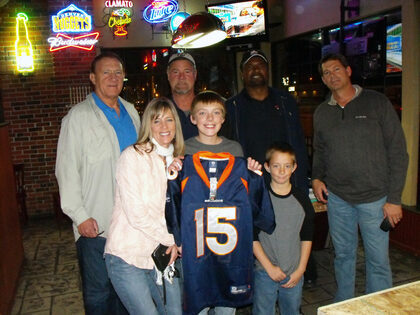 AN LED 48" HDTV 1080p WAS GIVEN AWAY AT MCCARTHY'S SPORTS BAR, 15350 SMOKY HILL RD, AURORA ON 3/15!!! 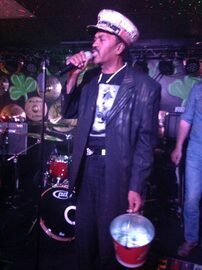 LimoDriver announced the winner on stage at McCarthy's. 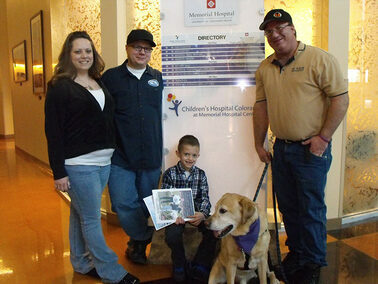 Donations Benefit the Friends of Jake Fund for Service Dogs. Pro Players Association coordinated a drive to aid the Colorado Flood victims in the hardest hit areas of the state. We worked with local agencies in an effort to facilitate receipt of the merchandise and distribution of the items to those most needy. 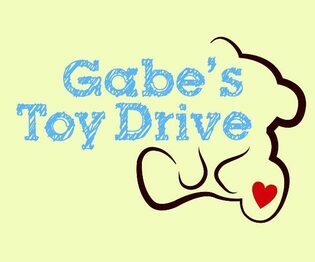 The drive has received contributions of new goods from Denver Broncos Gameday Merchandising, Kroenke Charities, Brooklyn Veterinary Clinic, Sam's Club, and Creager Mercantile. 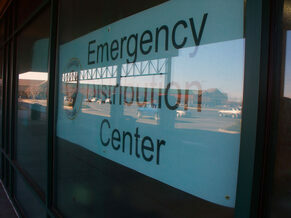 Rocky Mountain Conference of Seventh-day Adventists Disaster Response Division, a local non profit, will assist by providing a location for distribution and volunteers. The merchandise will be distributed to FEMA-Registered victims of the floods. This is done to be sure the donated goods are getting into the right hands. 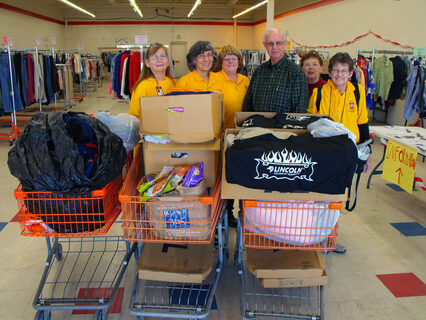 The new clothes and household goods were delivered to the Loveland, CO Flood Distribution Center on Sunday, March 16, 2014. Volunteers at the Loveland, CO Flood Distribution Center pose with some of the new clothes and household goods gathered and donated by Pro Players Association. 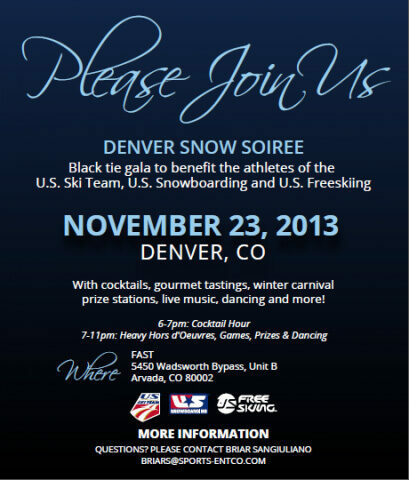 Pro Players Association presented the Silent Auction at the Snow Soiree.The event was a benefit for Team USA in their trek to bring home the GOLD! 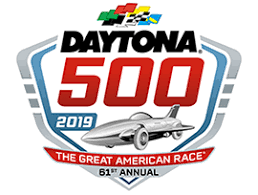 Pro Players Association CEO Gary R. Adler is seen shaking Colorado Avalanche Mascot Bernie's paw and PPA member Fred Gayles, Jr., the race's Grand Marshal, is seen presenting awards to the race's winners in the above video. 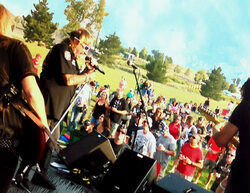 The 9th Annual Race took place in Denver's Washington Park on Sunday, November 11, 2012. The successful event helps fund Fetal Hope's mission to provide support, provide information, fund research, increase awareness and to be an outlet for leading medical information pertaining to fetal syndromes. A Gala Evening was had Saturday, May 4, 2013 at Lionscrest Manor, the luxurious and private 50-acre Victorian estate, located in Boulder County to benefit the Ukraine Orphans Outreach. The evening kicked off with ‘cocktails and shopping’ at the Silent Auction Cocktail Hour and was followed by a delicious dinner. 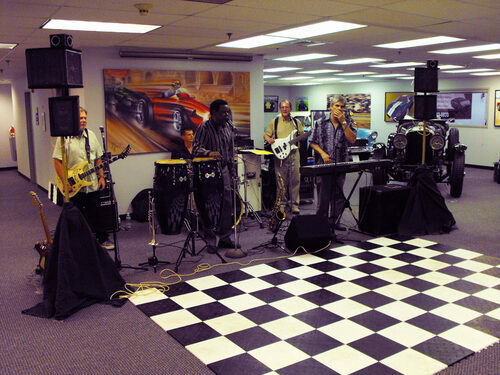 “FACE Vocal Band” provided the live entertainment, and a keynote address was presented by Denver’s 9News Reporter Anastasiya Bolton. 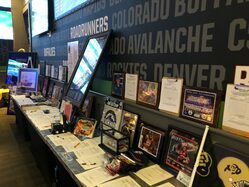 Pro Players Association provided items for the Silent Auction including a John Elway hand-signed memorabilia plaque, and a Babe Ruth and Lou Gehrig custom framed photograph with plate autographs. Ukraine Orphan Outreach (UOO) is a non-profit organization formed by adoptive parents and others with concern for the future of orphaned Ukrainian children. Their mission is to reach out to this often forgotten group of older kids and make a difference in their future. Please click on the arrow in the circle below or the arrow on the video control bar to see a video produced by KOAA-TV Colorado Springs. WRCA Champion Jessica Mosher draws the winning number a Thunder in the Valley, July 14, 2012. 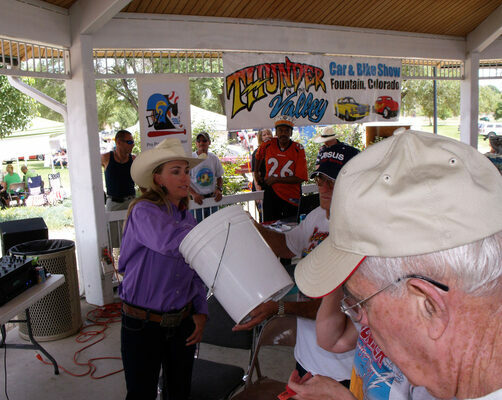 Jessica Mosher and The Entertainer Known as the Limo Driver sign autographs at Thunder in the Valley, July 14 in Fountain, CO.
SUPER BOWL PARTY RAISES FUNDS FOR FOOD BANK! 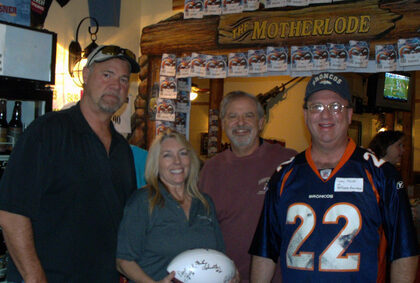 We held our annual fundraising effort for Food Bank of the Rockies at the Olde Towne Tavern, 2410 W. Main Street, Littleton, CO during the Super Bowl on Sunday, February 5, 2012. Celebrities in attendance included former Broncos Paul Howard, Mark Cooper, Mike Schnitker, ESPN Radio's former voice of the Raiders Kurt Hansen, and MLB HOF Umpire Bob McCaslin. 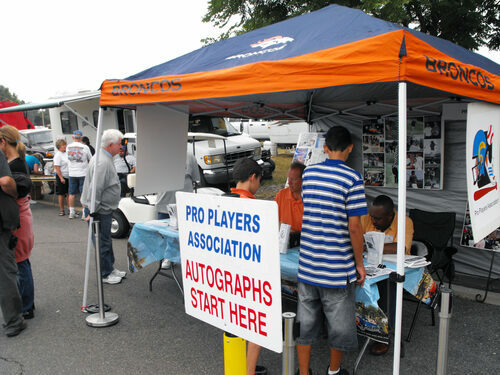 Pro Players Association hit the road for 2011 Broncos away games events.“Party With The Broncos" tour arrived in five Colorado towns during the NFL regular season. 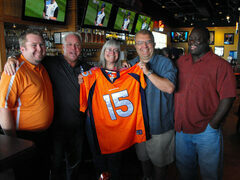 Pro Players Association’s Denver Broncos Alumni celebrities mingled with fans at sports bars and signed autographs raising some funds for local needy charities in each community. 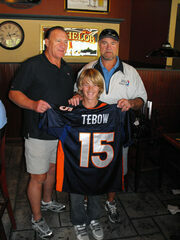 An NFL Denver Broncos Tim Tebow “On-Field” Jersey and several other prizes were given away at each location. Salida was a success! 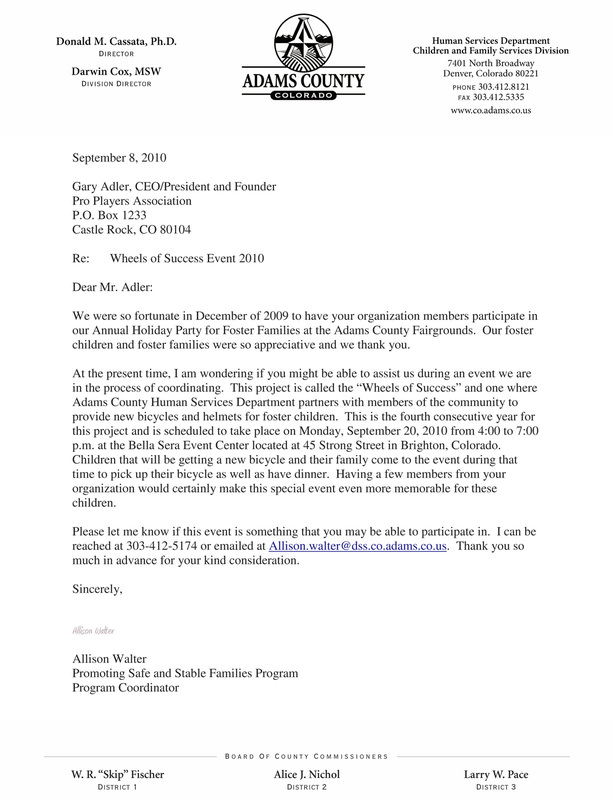 Thanks to Coors, Hertz, Salida Rotary, and Wallbanger's! 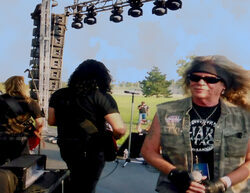 From left: Kurt Hansen, Gary R. Adler. 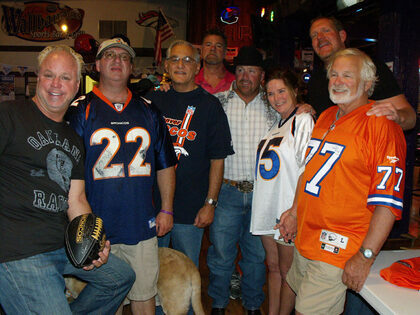 Terry Scanga, Dave Studdard, Sean Pike, Salida's winner of the Tim Tebow jersey, Ralph Tamm, and the winner's husband. 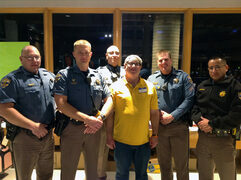 Funds were raised to support the Salida Rotary Scholarship Program. 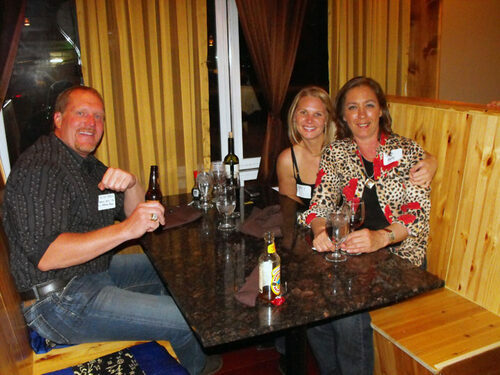 Fort Morgan's event at Cables Pub & Grill raised funds to benefit Baby Bear Hugs Expectant Mother's Education Program. Tebow jersey winners Mrs. Bride and her sons Brayden and Noah pose with Paul Howard, Dave Studdard, Marvin Montgomery and Brian Fisher. 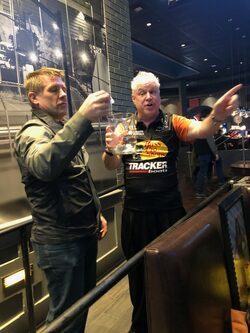 Idaho Springs events held November 12 Celebrity Bartender Night and November 13 Party with the Broncos at Tommyknocker Brewery & Pub, 1401 Miner St., Idaho Springs benefited the Clear Creek Sports Scholarship Program. Here former Bronco Dave Studdard and PPA CEO Gary R. Adler present an autographed Broncos History Football to venue managers Kathie and Steve Baratta for all their hard work and devotion in promoting the events. 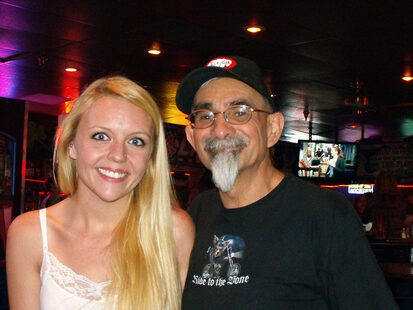 Falcon's fundraiser was standing room only at Frankie's Too, held Sunday November 27, and OH! What a game! 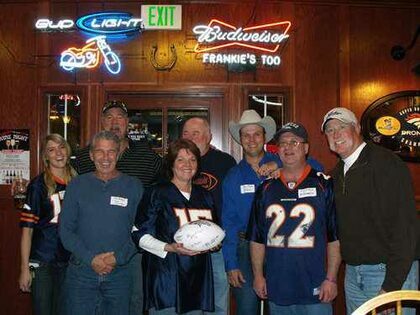 Pictured presenting the PPA Broncos Football, in the back row from left: Pro Players Girl Deidre Prout, former Denver Bronco Dave Studdard, Frankie Patton of "Frankie's Too", Pro Rodeo's Chad Mosher, MLB Hall of Famer Rich "Goose" Gossage; front row: MLB Hall of Famer Bob McCaslin, Kathy Patton(wife of Frankie), PPA CEO Gary R. Adler. 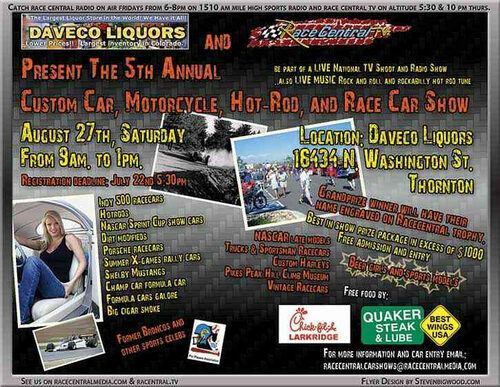 On Saturday, August 27 at Daveco Liquors, 16434 N. Washington Street, Thornton Pro Players Association presented an autograph signing at our booth featuring former Denver Broncos and other sports and media celebrities. 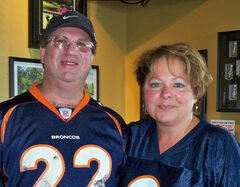 The after-party was held at Quaker Steak & Lube, 10392 Reed Street, Westminster. Pro Players Association celebrities and their families marched in the Douglas County Fair & Rodeo Parade, Saturday, August 6, 2011 along Wilcox Street in Castle Rock. 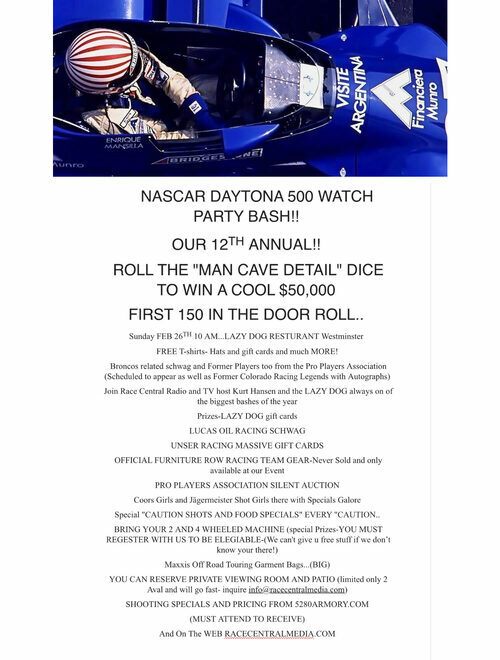 PPA participated in support of our sponsor Sandy Anderson 8z Real Estate. Dave Studdard, Mike Harris, Gary R. Adler, Storm Adler, Paul & Jackie Howard were among the celebrities marching and riding the float. 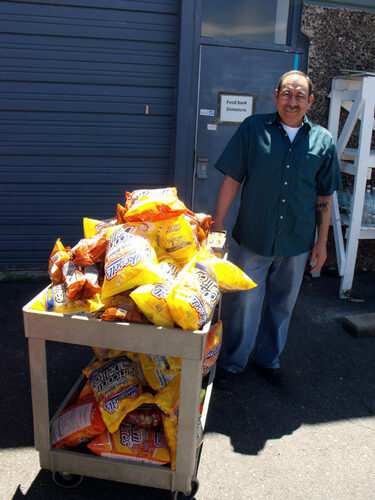 Pro Players Association donated approximately 180 bagged varieties of snack foods and several cases of food bars to the Douglas County Task Force Food Bank on August 3, 2011 in our effort to help fight hunger. 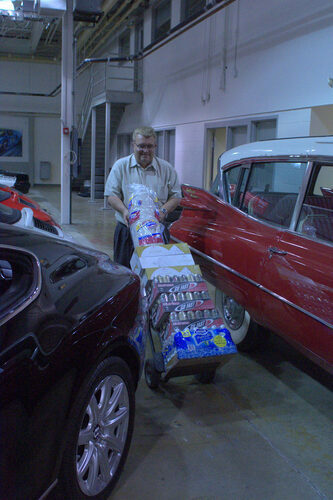 A member of the Douglas County Task Force accepts our donation of food in our effort to fight hunger, August 3, 2011. Photo by Blind Images 2011. Sandy Anderson 8z Real Estate held a Grand Opening and Open House of their new office location at 200 Wilcox Street, Castle Rock on Friday, July 8th, 2011. 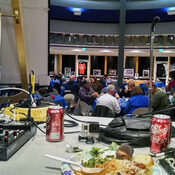 The event featured our own Mike Harris - Music by Mike Mobile DJ, and Dave Studdard of the Pro Players Association was on hand to sign autographs. A BBQ offering food and drink was served. 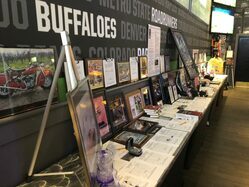 A silent auction was held presented by Mobile Memorabilia, the official collectible dealer of the Pro Players Association to benefit the Douglas Elbert Helping Hands. The group of area realtors gathers annually to provide home/property care assistance to the elderly and/or persons with disabilities in the Douglas/Elbert county regions of Colorado at no cost. They round-up several local sponsors to provide the required materials and the realtors provide volunteer community service to accomplish the tasks at hand. 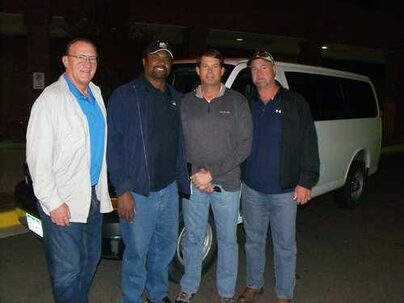 * KUDOS to Hertz Corporation for the use of a van to transport the celebrities and staff to Fort Morgan. 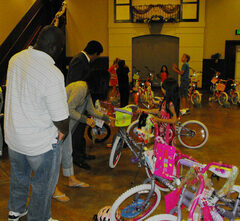 Timmy Smith former Redskin and Cowboy and his wife Bobbi present a bicycle and helmet to a foster child. 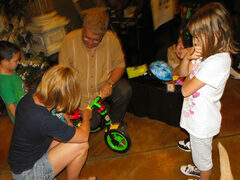 Mike Harris, Denver radio personality helps adjust a bicycle for one of the foster kids in Adams County. 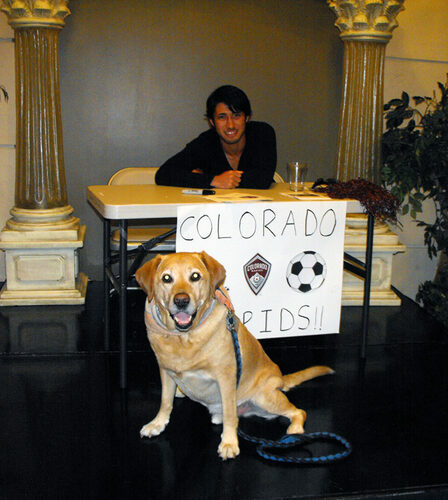 Storm and Colorado Rapids Defender Kosuke Kimura hanging out at the Wheels of Success 2010 Event. Pro Players Association celebrities provided an autograph session for the Betty Ford Center "Celebrate Bing A Kid" program at the Doubletree Hotel, Aurora, CO on Sunday, April 18, 2010. 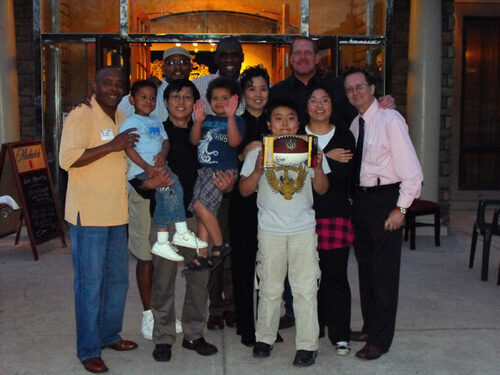 The center's non-profit children’s program works with children ages 7-12 who come from addicted families. They offer a 4-day program once a month and subsequent weekend programs a couple of times a year. The program never turns children away due to a family’s inability to pay the program cost. They hope to build on the strengths of each child and help them identify safe people with whom they may share their thoughts and feelings. This event is something they hold for the children each year to celebrate being a kid, there are arts and crafts, lunch is included, there are great door prizes and giveaways and it is all free to the children and their families.Thanks to former Broncos Marvin Montgomery, Michael Ditchfield and Willie Oshodin for volunteering their time to participate at the event. 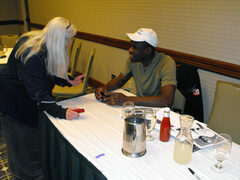 Former Bronco Willie Oshodin chats with one of the parents at the "Celebrate Being A Kid" autograph session. 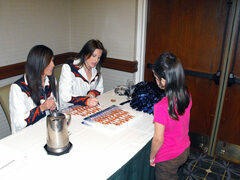 Denver Bronco Cheerleaders signed autographs for the children at "Celebrate Being A Kid". 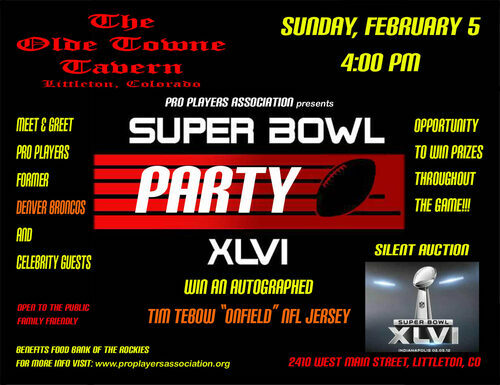 Pro Players Association’s former NFL players and other celebrities got together for a Super Bowl Party at The Sports Book Sports Bar, 1434 Blake Street, Denver. Pro Players Association celebrity athletes, entertainment, and media personalities were on-hand to mingle, sign autographs, chat about their careers, and enjoyed watching the Super Bowl with the crowd. A guest won an autographed Kyle Orton NFL football in a display case and several others participated in a Sports Trivia Challenge and won a variety of other prizes. 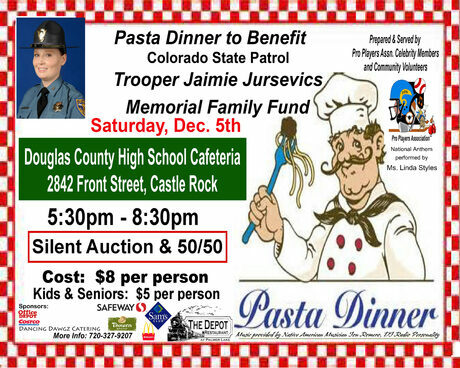 A portion of the funds collected from the event will benefit the Food Bank of the Rockies. Thanks go out to Val and Tito, and their staff for hosting the event! 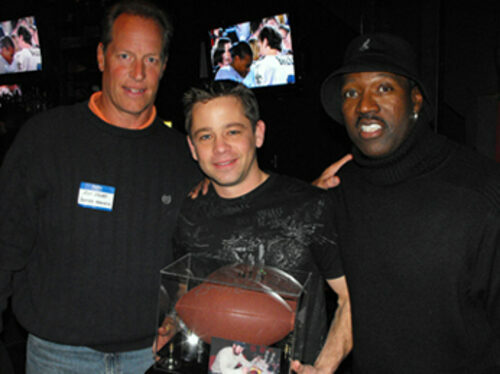 Former Broncos Ron Egloff and Mike Harden present the Kyle Orton NFL football to it's winner Brian Proffitt at The Sports Book, Denver on Super Bowl Sunday, February 7, 2010 which benefitted the Food Bank of the Rockies. Pro Players Association presented a "Meet & Greet" autograph session for the foster children and their families on Friday, December 11, 2009. Pictured above from top to bottom: Former Broncos Mark Jackson, Willie Oshodin, MMA World Champ Jeff Ford, Rocky Mountain Roller Girls Red Dye and Whipity Pow. 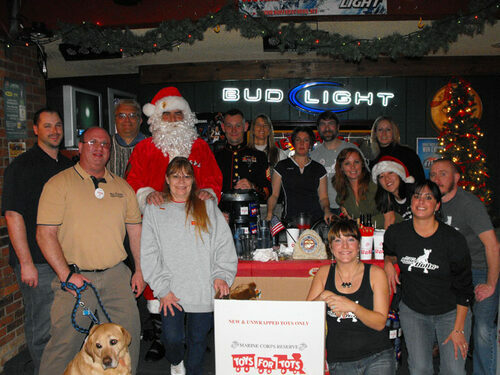 TOYS FOR TOTS RAISES CASH AND BRINGS IN THE GOODIES! 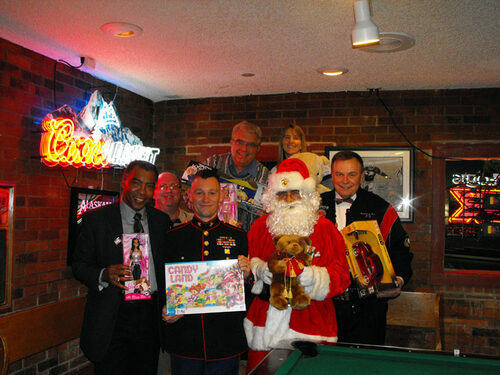 Pro Players Association helped gather toys and cash for Toys or Tots USMC Campaign at Dirk's Sports Tavern in Littleton, CO, Friday, December 4, 2009. 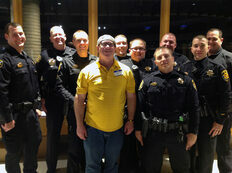 Pro Players Association members surround USMC Sgt. 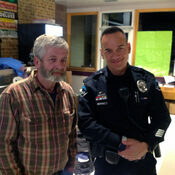 Travis Neuman and Santa Claus with Toys For Tots. Pictured left to right former Bronco Bill Harris, PPA President & CEO Gary R. Adler, PPA DJ Mike Harris, PPA Office Assistant Karen Opp, Mile High Sports Radio's Gil Whiteley. 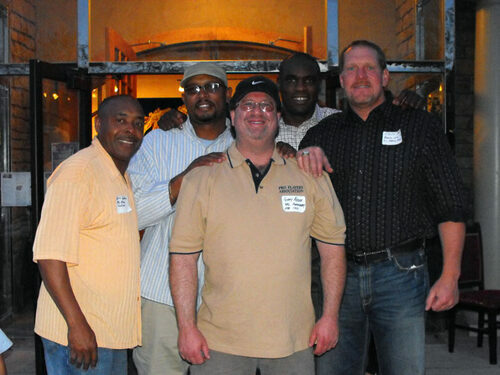 Pro Players Association’s former Bronco players and other celebrities gathered at Pifler's Sports Tavern, Lakewood, for "Party With The Pros" Broncos Game Party, Sunday, November 15, 11AM, to benefit CYMBAL. The celebrity athletes, entertainment, and media personalities were on-hand to mingle, sign autographs, chat about their careers, all while they enjoyed the football game with the crowd. 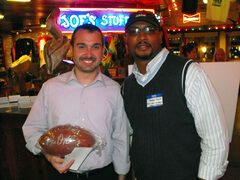 One lucky guest won an autographed, Kyle Orton NFL Football. Other giveaways for a variety of prizes also took place throughout the game. 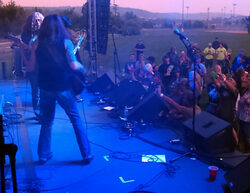 Funds from the event were collected to benefit CYMBAL - Colorado Youth in Music Benefit Academic Learning. The program provides the opportunity to at-risk and disadvantaged youth to learn music appreciation and how to play an instrument.These children are the ones who have been most affected by the budget cuts in the school system's low income areas. 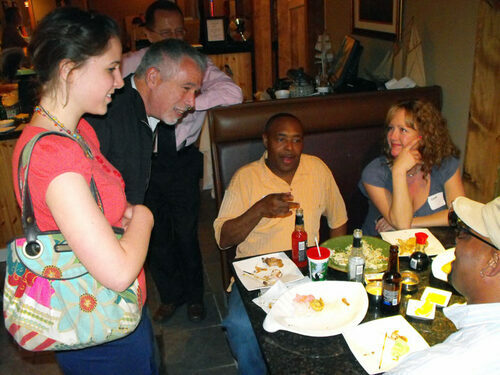 Local music professionals are volunteering their time and expertise to the program. Funds are needed to provide and maintain instruments, sheet music, equipment and supplies necessary for the program's success. Your generous donations were greatly appreciated. 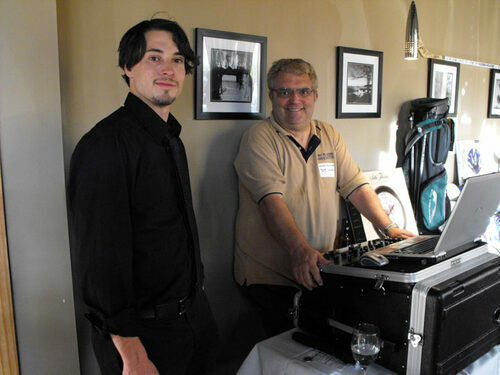 Thanks to Garrett and all the staff at Pifler's for helping to make the event the success that it was! For more information on CYMBAL, please visit our Umbrella Organizations page. The Military Family Fund benefit had a great turn-out of celebrity volunteer bartenders, September 17, 2009. 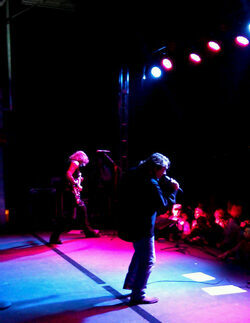 Check out the great photos on Pasta Jay's web site. Pro Players Association showed it's support and presence at the Childrens Hospital Burn Center fund raiser at the Arvada Center on August 30th providing an autograph session to the crowds of spectators. 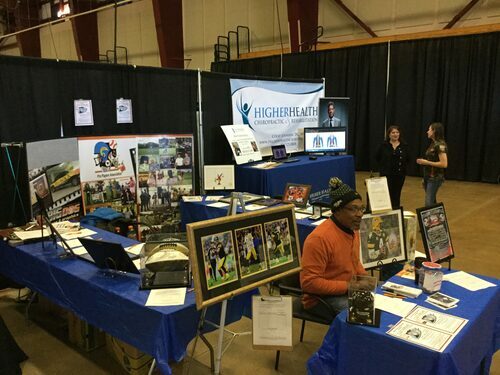 Celebrity members former Pittsburgh Steeler/Tampa Bay Buc Dave Reavis, Arena Football Hall of Famer Myron Jefferson, former Denver Broncos Ron Egloff and Dave "Sarge" Preston autographed over 800 photographs. 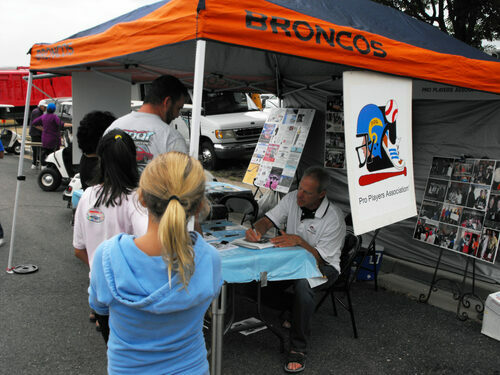 Former Denver Bronco Ron Egloff and Arena League Hall of Famer Myron Jefferson sign autographs at the Hot Times Kool Cars Childrens Hospital fund raiser, August 30, 2009. Former Denver Bronco Dave "Sarge" Preston has fans lined up waiting on their personalized autographed photo at Hot Times Kool Cars. Pro Players Association in affiliation with America's Bar & Grill of Aurora present a check for funds raised during the Pro Players Association's 2008 Sunday Broncos Football Fundraiser held at America's on June 25, 2009. 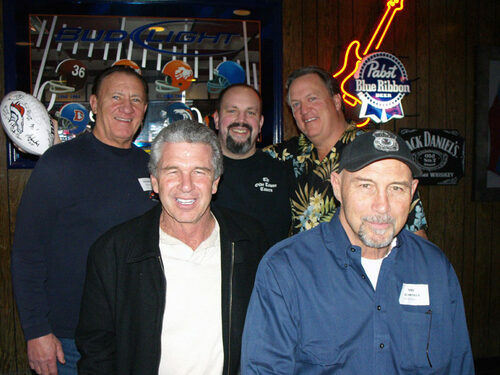 Back row left to right: America's Owner Andy Moreland, former Broncos Dave Studdard, Paul Howard, Ron Egloff and Willie Oshodin. Front row left to right: PPA President & CEO Gary R. Adler, America's General Manager Rick Moreland, Chaplain Colonel Andrew C. Meverden and Family Program Specialist Ijigale R. Beltran. Floor: PPA Official Mascot Storm J. Adler. "KIDS ON TRACK COCKTAILS & CULINARY CREATIONS"
The crew from La Sandia presented their fine Mexican cuisine. 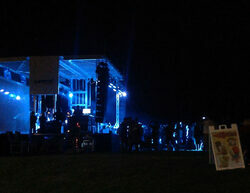 Tiny Barge and the Big Chill rocked the night away. PPA member Mike Harris lends a hand at the museum. 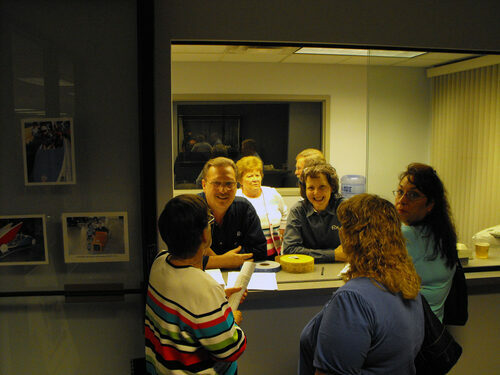 Jerry and Bernie Stander ran the ticket window for the evening. 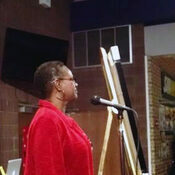 Lenora Kingston of Single Volunteers shared her bartending talents. An awesome auction of 48 unique items was presented. "I'm turning Japanese. I think I'm turning Japanese. I really think so". 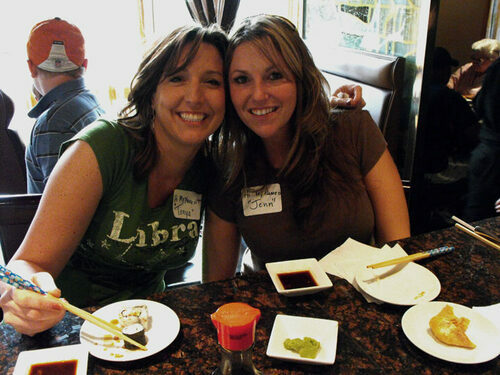 Pro Players Association's Super Bowl Party 2009 was a hit at Mikuni Japanese Restaurant and Sushi Bar. Celebrities and special guests enjoyed the "Monsters vs Aliens" commercials in 3D. 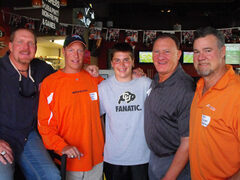 Paul Howard, Ron Egloff, Dave Studdard and John Grant share some Bronco memories at America's Bar & Grill's diabetes fundraiser, Wednesday, September 10, 2008. Aaron Smith, Louie Wright, Steve Haggerty and Billy Thompson hanging-out at the America's Bar & Grill fundraiser on September 10 in Aurora.